HIGASHI, OKINAWA PREF. 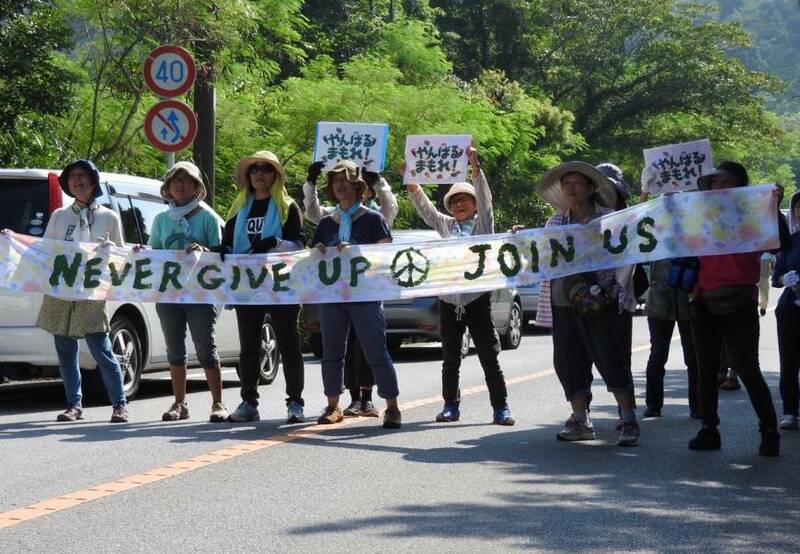 - Public anger is rising on Okinawa at a proposed site for new U.S. military landing pads, with residents and reporters criticizing what they say are heavy-handed tactics by the Japanese authorities to push the project through. Last month, the U.S. military declared it was preparing to revert to Japanese control almost 4,000 hectares of jungle land from its Northern Training Area, Okinawa. The timing of the announcement was widely seen as an attempt to defuse local fury following a spate of American crimes on the island, including the alleged murder of a woman by a former Marine in April. One month after the announcement, however, tensions on Okinawa are more inflamed than ever. Residents are angry over the conditions attached by Tokyo and Washington to the upcoming land return: the construction of six new helipads in Takae, a district of the village of Higashi with a population of fewer than 150 people. Two of those helipads — measuring 75 meters in diameter — have already been completed. But villagers are determined to block the construction of the others, citing risks posed by low-flying aircraft, including Ospreys, and damage to the environment. The area is said to be home to more than 170 endangered species. 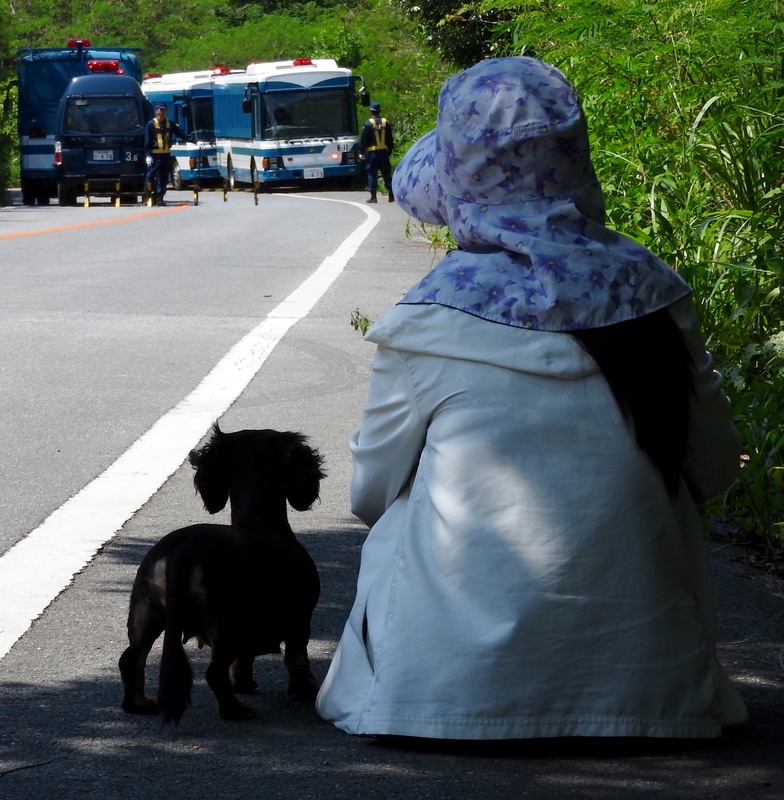 Since July, when the government restarted construction work, demonstrators have jammed Takae’s roads in tense standoffs with riot police. Police roadblocks back up traffic for kilometers, snarling protesters, farmers and vacationers for hours on end. Earlier this week, journalists were corralled by the police and prevented from reporting on the demonstrations in a move decried by lawyers and media labor unions as infringing on the freedom of the press. Protesters sit down in the roads and park their cars across entrance gates to try to block trucks ferrying supplies to the helipad construction sites. As the police clear them away, demonstrators have been injured. On Monday, two protesters were hospitalized following confrontations. 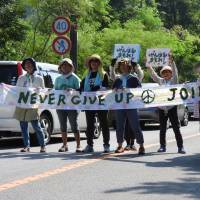 One of those taken from the scene by ambulance was 87-year-old peace campaigner and World War II survivor Fumiko Shimabukuro, who required stitches to a laceration on her hand. Undeterred, she returned to Takae to protest the following day. However, on the ground at Takae, residents say they are skeptical of such promises. “Ospreys fly low over our home at night and our children can’t sleep. If the new helipads are built, things will only get worse,” said resident Yukine Ashimine. The noise from low-flying military aircraft has recently grown so bad, she said, that she was forced to move to the neighboring district. Actions by the Ministry of Defense have only added to local anger. 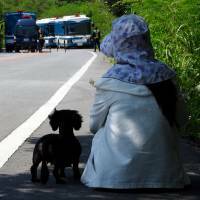 Following a spike in crime by U.S. personnel in the spring, the government promised to dispatch dozens of security guards to Okinawa to make residents feel safer. However, instead of deploying them to the areas where the crimes occurred, the guards have been sent to Takae to secure the construction sites of the new helipads.